The earthquake and Tsunami have mainly affected Miyagi (4), Fukushima (7) and Iwate (3). People have shown concern about Aomori (1) and Ibaraki (8). While the quake was felt in many other places throughout Japan, including Shizuoka (22), we are not at any immediate risk in Shizuoka. As far as I know, damage has been reported as far down the east coast as Kanagawa (14), where Yokohama is situated, and of course in Tokyo (13) too. 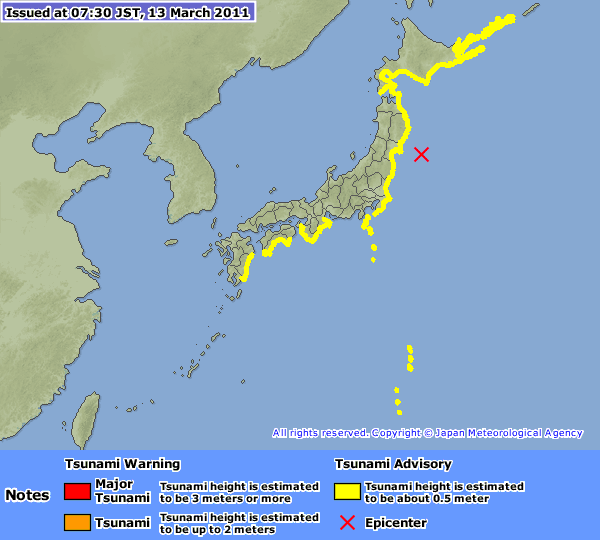 The tsunami warning along the east cast remains “advisory”, but it does seem to be calming down now. One more thing to mention, for fellow British nationals living abroad (in Japan or elsewhere), I really do advise you to register with “Locate”, a service run by the Foreign Office. You can find information about it here. Locate actually called me this morning to check I wasn’t in any trouble. I really appreciate getting their call. Thanks so much for the Hamamatsu update. I lived in Hamamatsu 20 years ago and still have friends there. I was very worried about them when I first heard the news of the earthquake and tsunami, but reading your posts set my mind at ease. Keep the information coming!! Thank you for your comment Linda in San Diego. I’m glad my bog could reassure you a little. I hope your friends are all ok. Situation remains fine in Shizuoka Prefecture tonight. So glad that u r safe! Thank u for ur explanations, update, n maps. Take good care of u.